The best American movie nobody saw in 1999. Highly recommended rental. Robbins weaves a wonderful tapestry of high and low Manhattan stories that all intersect in the guerrilla production of this banned play. The film opens with a simple but potent tracking shot that unmistakably sets the Depression era atmosphere. A penniless, hungry and downhearted young woman in a tattered dress (Emily Watson, "Hilary and Jackie," "Breaking the Waves") is chased out of a movie theater where she was sleeping and slowly mopes down the empty morning streets, washing her face in the trickle from a fire hydrant and meekly asking passers-by if she can sing them a song for a nickel. The camera then pans up the side of an apartment building an into a window where an exhausted, frustrated, scruffy, out-of-work playwright (Hank Azaria) has been sitting at a piano all night, seeking musical inspiration in imaginary conversations with his dead wife. These two will eventually come together -- along with a prima donna Orson Welles (Angus MacFadyen), an unemployed actor with five mouths to feed (John Turturro), a bemused socialite (Vanessa Redgrave, on her way to an Oscar nod) who takes great delight in slumming with the journeyman class, and several others -- in this play, which Azaria writes from his frustration. Meanwhile, Robbins follows several parallel storylines, featuring a cross-section of Hollywood's and Broadway's best in facetious and famous roles. John Cusack shows up as Nelson Rockefeller, who hires painter Diego Rivera (Ruben Blades) to create a grand mural in the lobby of his new Rockefeller Center, only to fire him when he discovers the painting symbolizes the scourge of capitalism run amok. He crosses paths with Susan Sarandon, as an Italian attache in America trying to secure support for Mussolini from rich industrialist -- a subplot absolutely dripping with irony. Bill Murray is fading Vaudeville ventriloquist and right-wing paranoid who falls miserably in unrequited love with an uptight, red scare-crazy clerk at the WPA Theater's dole queue (Joan Cusack, period-perfect in finger-waved hair and hat-pin hats). She is trying to organize a grass roots campaign to shut down the program, even though it's her bread and butter. 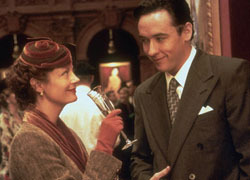 The moral center of the film is a track that follows Cherry Jones (a wonderful Broadway actress, seen in last year's "The Horse Whisperer") as the ever-optimistic head of said Federal Theater project, who goes to Washington to face down a congressional committee rifling through the WPA on a communist witch hunt. With so much going on, you'd think Robbins would lose track of a story here and there, but "Cradle" is surprisingly easy to follow -- even as the director peppers nearly every scene with refreshing depth and detail. It all pays off in the beautifully edited finale that juxtaposes the defiant, emotional production of the play with a costume ball attended by Rockefeller, William Randolph Hearst and other industrialists, all dressed -- with none-too-subtle irony -- as 18th Century French aristocrats. There may still be people out there who would disapprove of the underlying political themes put forth in "Cradle Will Rock" (keep in mind the message is about free speech, not necessarily about what's being said). But for a movie this superlative and dexterously crafted, it's worth setting aside politics for a couple hours to just enjoy a great movie.